Rally of the Disabled in Minsk, 5 May 2016. Source: belapan.comAny traveller to Belarus who strolls through the streets of its capital or any other cities for that matter, will not likely see disabled people, wondering if they indeed exist here. Yet according to Belstat, about 500,000 Belarusians suffer from various disabilities, making up 6 per cent of the population. Among them, around 20,000 are wheelchair users. These people are often left on their own in the struggle for equal opportunities. 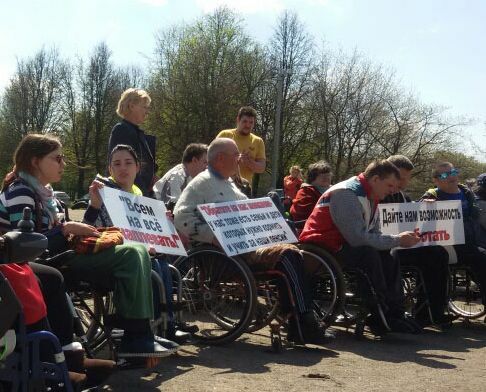 Only a few dozes of disabled managed to attend the rally in Minsk on 5 May 2016. The organiser of the event, the Republican Association of the Wheelchair Users, wanted to highlight basic needs of the disabled, primarily creation of barrier-free environment and ending discrimination. Unfortunately, the rally took place far from the city centre, on the Bangalor Square, invisible to the wider audiences. It is a traditional venue where Belarusian authorities allow the opposition to organise political protests, thus conveniently moving them away from public attention. Same scenario applied to the protest of the disabled, only in their case authorities did not even care to send the police forces to secure order. Neither medical teams nor restrooms were available on site, indicating callous neglect from the side of the state. Ordinary Belarusians often display similar attitudes, pitying disability or seeing it as a drawback. Belarusian model Angelina Uelskaja aka Angel of Wales demonstrated how disabled people can fight these stereotypes. She built her career and achieved professional success despite the diagnosis of cerebral palsy. 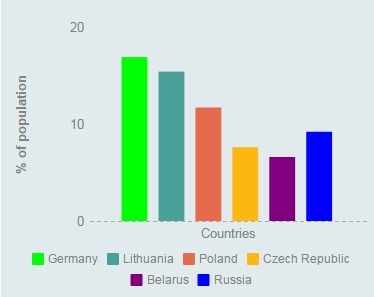 Disability prevalence overview (Sources: Eurostat, Belstat, USAID)On 28 September 2015, Belarus signed the UN Convention on the Rights of Persons with Disabilities, committing to the creation of an inclusive community. Recently, it also funded a series of initiatives to introduce facilities for the disabled into urban spaces. One of them was the state program of barrier-free environment for 2011 – 2015 aimed to improve the quality of life of the disabled. According to the representative of the Ministry of Labour and Social Protection, Anatol' Razhanec, the program turned out to be a success, overfulfilling its goals in the best traditions of the Soviet record-setting. Instead of initial re-equipment of 5,000 facilities to meet the needs of the disabled, the state constructed 9,000 barrier-free access points. In Minsk alone, it has spent over $3.5 million, creating 2,107 barrier-free objects. Minsk subway invested over $150,000 into re-equipment of the stations: overall, 32 stations now have elevators, special platforms or ramps. What this optimistic statistics does not reflect, is how many disabled people have benefited from the new barrier-free environment. Many of these new facilities are extremely difficult to use, while others are there just for a show-off or simply do not work. In a recent incident at the train station in Puhavichy, Viktoryja Zhdanovich, suffering from cerebral palsy, wanted to use the elevator, installed on the bridge over the tracks. After failing to turn it on, she had to contact the station employees, who demanded to see a special ID, identifying her as a disabled person. In the end, Viktoryja still could not use the elevator – it did not work. According to Siarhej Drazdouski, who coordinates the Office on the Rights of Persons with Disabilities, most problems of the disabled Belarusians stem in discrimination. Pointing out the chief responsibility of the state, he suggested amendments to the Law on Social Protection. New clauses should define discrimination of disability, provide for its prevention, and protect the rights of people with disability. Disabled campaigning for parking spots. Source: raik.byCurrently, discriminative practises surround all aspects of everyday life of the disabled. Many stores, administrative and residential buildings often lack necessary ramps for barrier-free access. If a wheelchair user travels abroad by car, he or she is stuck in lines for hours at the border crossings, which usually lack adequate restrooms. 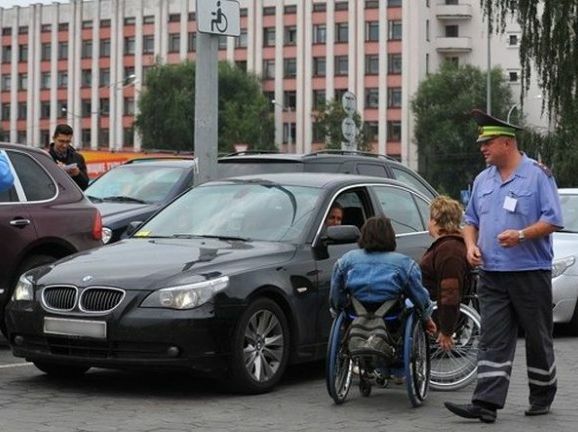 Parking spots for the disabled started to appear in Belarus only about five years ago. Yet drivers often ignore this innovation and feel free to park their cars in these stalls. In April 2016, activists of the Republican Association of the Wheelchair Users launched an awareness campaign, reporting parking violations to the police and the media. However, some recent trends show more promise for people with disabilities. For instance, barrier-free tourism directly addresses people with disabilities, seniors, and families with young children. One of the initiatives in this sphere is a collaborative project of several Belarusian NGOs and Valozhyn administration in the Naliboki Forest. Using the grant from the EU, they plan to create a tourist itinerary and a hostel suitable for people with disabilities by 2018. For such projects to succeed, Belarusian society still needs to change its mentality and overcome stereotypes. Most of them root in the Soviet practises of marginalising the disabled people and removing them from public spaces, as it happened with the disabled WW2 veterans on the eve of the Moscow Olympics in 1980. Equally important is the challenge for the contemporary Belarusian state, which should abandon indifference and take the lead in securing basic constitutional rights of its citizens with disability.